The first step in generating an e-Way bill is to register on the e-Way Bill Portal. All GST registered persons (supplier, recipient, or transporter), are advised to create an account on the portal. Note: Transporters who are not registered under GST can still enrol and create an account on the portal to generate e-Way bills. This also applies to any citizen who wishes to move goods worth more than Rs. 50,000 for their own use. The registration process is easy for individuals registered under the GST regime. Click on the e-Way Bill Registration link to register. Enter your GSTIN and click Go. This will direct you to the second step of the process. When you enter your GSTIN, some fields like applicant name, trade name, address, and mobile number are auto populated. Select the Send OTP option at the bottom of the form, enter the number you receive on your registered mobile number and click Verify OTP. The final step is to create a username and password to access the system. The system verifies the username and sends either an approval or rejection message. If your username was rejected, a new name must be provided until the system approves. 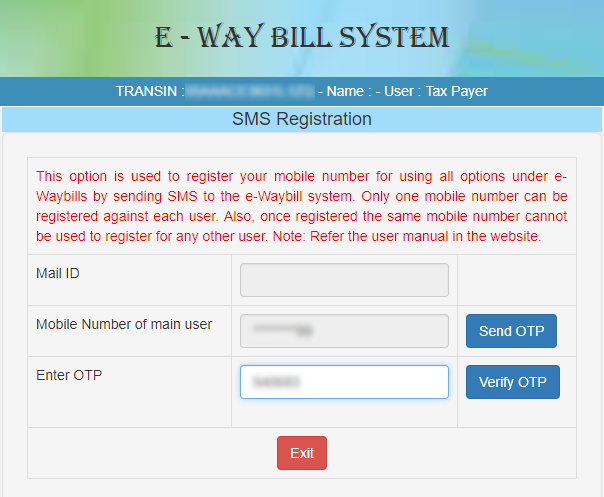 Transporters who are not registered under the GST regime will not be able to register for the e-Way Bill System using the forms discussed above. Instead, they can enrol using the Enrolment for Transporters link. The enrolment form consists of nine parts, beginning with a form for basic details like the transporter’s state, PAN details, and trade name. Once this information has been entered and verified, enter the business type and place and contact information for the transporter. The next section should be filled in only if you have access to the Aadhaar details of either a proprietor or major authority of the company. If you do not have access to this information, skip this part. The following segment requires you to upload ID and proof of address. 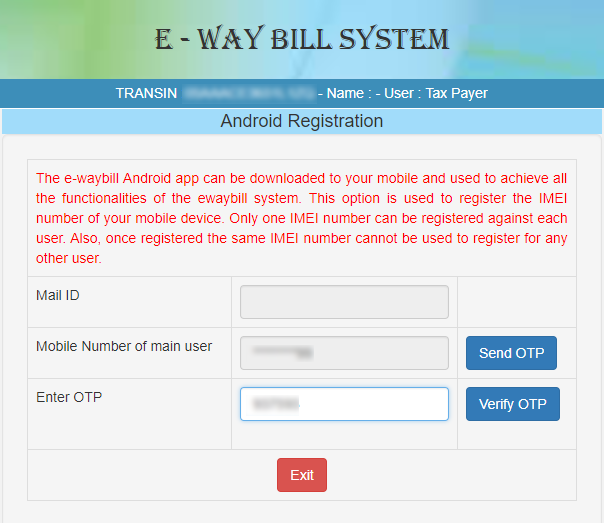 In the next step, you must set a username and password to access the system every time an e-Way bill is required. Finally, confirm that all the details you have shared are true and correct to the best of your knowledge. This completes the enrolment process for non-registered transporters and prompts the system to generate a 15 digit transporter ID (TRANS ID). This ID can be shared with a supplier or recipient who will generate an e-Way Bill. Log in to the e-Way Bill System by entering your username and password at the Login. Once logged in, you will be directed to the Main Menu. 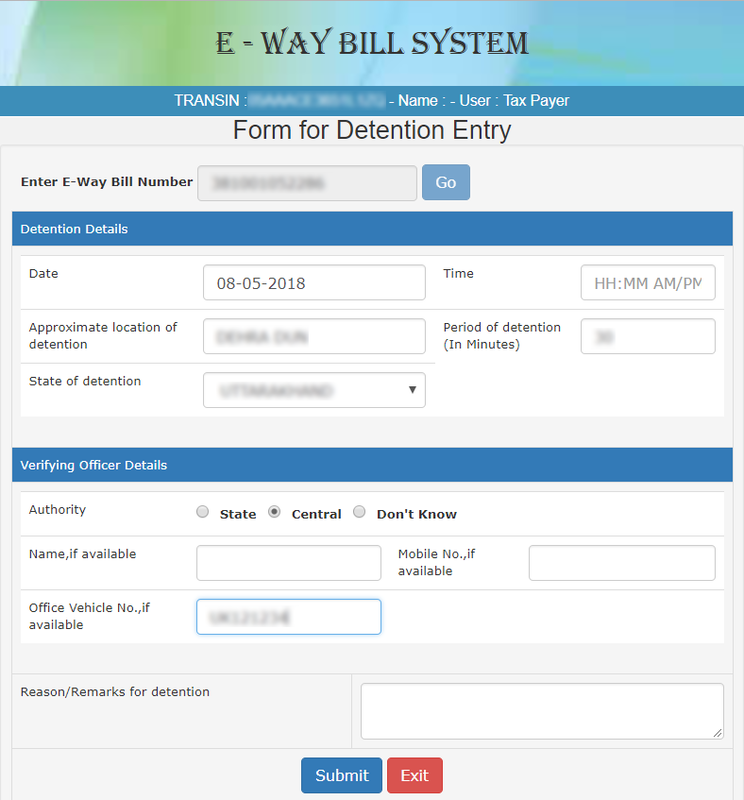 This lists all the available options: e-Way Bill System, Consolidated e-Way Bill, Reject, Reports, Masters, User Management, and Registration. 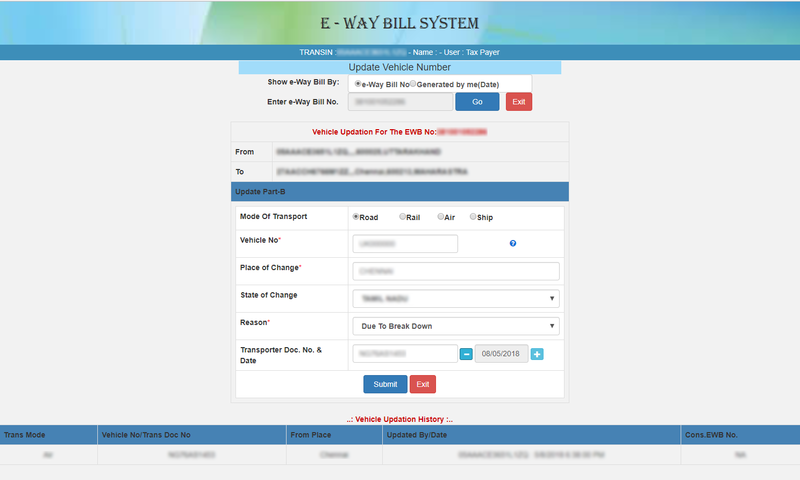 Above shown is the main menu of the e-Way Bill Portal. 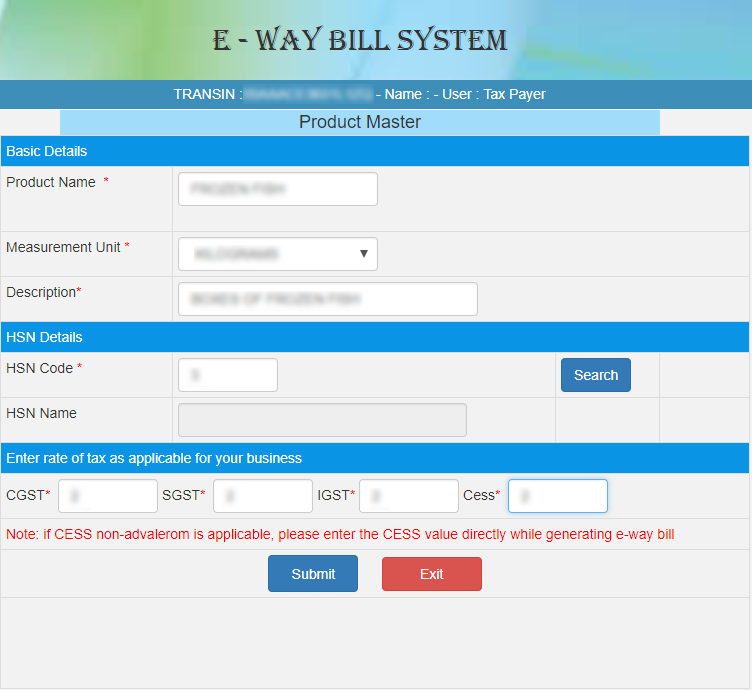 The Generate e-Way Bill tab under the e-Way Bill option directs you to the following screen. Before generating a new e-Way bill, make sure you have details for either the invoice, bill, or challan and the TRANSIN for the person or company assigned to move the consignment. The first part of the form asks for the type of transaction: inward (purchase) transaction or outward (sales) transaction. Next enter the document type, number, and date. Enter the from and to details including the supplier and recipient names, GSTIN, and source and destination locations. Next enter the consignment particulars, name, description, HSN, quantity, and taxable value. Finally, enter the transporter details including the mode of transportation, transporter name, document number, date of generating the e-Way bill, TRANSIN, and vehicle number. Once the form is complete, click the Submit button to request an e-Way bill. If there is any error or issue with the information you submitted, this will be indicated on the same screen or an EWB-01 form will be displayed with a unique 12 digit number. Clicking the Generating Bulk tab under e-Way Bills will redirect you to this page. Bulk e-Way bills are created when large businesses wish to generate multiple bills at the same time. To generate a bulk e-Way bill, you need to download the E-Way Bill JSON Format.xlsx or Consolidated E-Way Bill JSON Format.xlsx Excel template and the E-Way Bill converter tool.xlsm converter tool using the tools provided by the system. Once the files have been modified using the downloaded tools, select a JSON file to be uploaded and used to generate the bulk e-Way bill. After the JSON file has been processed, the system either generates individual e-Way bills for each consignment and displays them or shows any errors. This option allows you to update your vehicle number if you didn’t set it while initially generating an e-Way bill, or if there is a change in the vehicle. Click the Update Vehicle Number option. 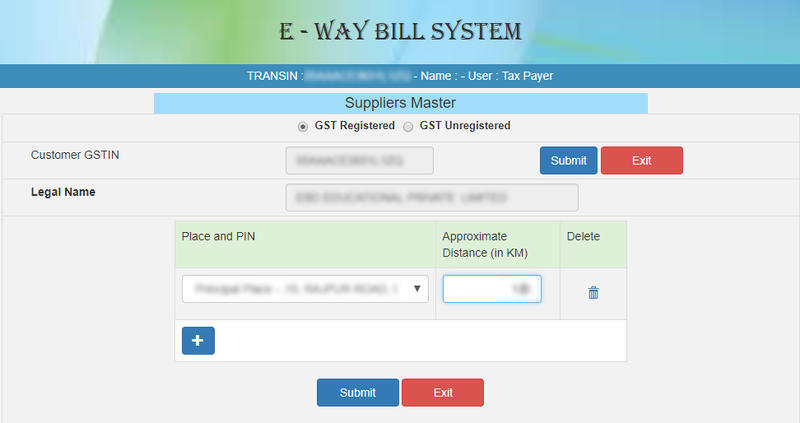 You can choose your e-Way bill either through bill number or date generated. Once you pick an option, a list is created for you to select your bill from. After you select your e-Way bill, you are redirected to a new form that asks for the following details: addresses of the sender and recipient, mode of transport and vehicle number, and reason for change of vehicle. If the mode of transportation is by rail, air, or ship, the transporter document number must be submitted instead of the vehicle number. When all the details have been entered, click Submit and wait for the system to approve your data. When it’s approved, the vehicle number will be updated immediately in the corresponding bill. There is a similar option to update vehicle numbers for bulk e-Way bills. The e-Way Bill System allows users to cancel bills for a valid reason, such as goods not being delivered correctly, incorrect entries, etc. Enter the e-Way bill number in the space provided. You will need to provide an appropriate reason for cancelling the bill. Once cancelled, the e-Way bill cannot be reused. Click the Printing e-Way Bills option. 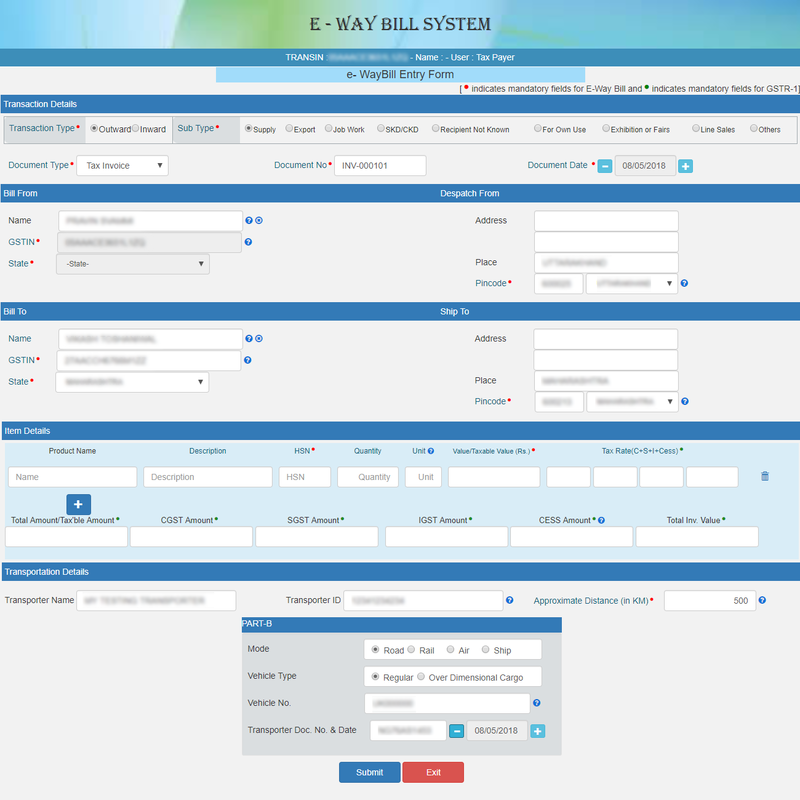 The system asks for the e-Way bill number and will then display the bill. At the bottom of the bill is an option to print, as seen in the example below. Printing an e-Way bill can come to be very useful and is therefore recommended. The e-Way bill is valid only for a specific period of time, after which it expires and a new bill must be generated. In special cases, the validity of an e-Way bill may be extended. Validity of an e-Way bill is calculated based on the distance travelled. One day is provided for distances of up to 100 km and an additional day is included for every 100 km travelled after that. For example, a total distance of 550 km will have a validity of 550⁄100 = 5.5 = 6 days. A bill which is valid for one day will expire at midnight (12 AM) on the day after generation, with validity starting as soon as you enter your Part-B details for the first time. It will not be recalculated for any subsequent entries made in Part-B. If validity expires before completion of travel, a new e-Way bill must be generated from the EWB portal. Part-A of the new bill remains the same while a new Part-B is created. The option to extend validity will be enabled for 4 hours before the expiration time of the e-Way bill and will be available until 4 hours after it expires. When a transporter is transporting multiple consignments in the same vehicle, the system offers the option of generating a consolidated e-Way bill. A consolidated e-Way bill is a single document created by merging a collection of individual bills for each consignment. To generate a new consolidated e-Way bill, click the Generating New option under the Consolidated EWB tab to go to the page below. This form requires the mode of transportation, starting location, vehicle number, and e-Way bill details for each individual consignment. You can add multiple bills by clicking the + symbol at the bottom of the form. Once complete, click Submit. The consolidated e-Way bill should be created by either the same person who generated the individual bills being consolidated, or the transporter of the consignments. The system will not allow users who are not directly involved to enter the details of the bill. A bulk consolidated e-Way bill is generated when a user requires multiple consolidated e-Way bills at the same time. The process is similar to generating a bulk e-Way bill. You must have the EWB bulk convertor or the Excel file, which can be downloaded on the tools link, to create a bulk consolidated e-Way bill. This is to help convert multiple files into a single JSON file. Once the files have been converted and are ready to use, click Generate Bulk under the Consolidated EWB tab. Click Choose File to select the converted file and then Upload and Generate so the system can use this file to generate a bulk consolidated e-Way bill. Once processed, the system will either display the generated consolidated bills or errors for each request. Update the vehicle number by clicking on Re-Generate under Consolidated EWB. The consolidated e-Way bill can be identified either by the bill number or the date generated. On entering the necessary details, you will be shown a form asking for the starting location, vehicle number, and reasons for the change. Click the Print option under Consolidated EWB and enter the consolidated e-Way bill number to print the bill. Masters are detailed descriptions of all the products, clients, suppliers, and transporters frequently dealt with by a user. This helps simplify the process of filling out multiple forms for generating an e-Way bill. There are four types of masters which can be created by the system: products, clients/customers, suppliers, and transporters. After selecting Products enter basic product details including the HSN and applicable tax rates for the products. Multiple products can be added. The form below is to create a product master. If you choose Clients, you will be redirected to the form below. The client/customer master has two separate forms, one for GST registered and another for GST unregistered users. The form below can be filled by those who are registered under GST. 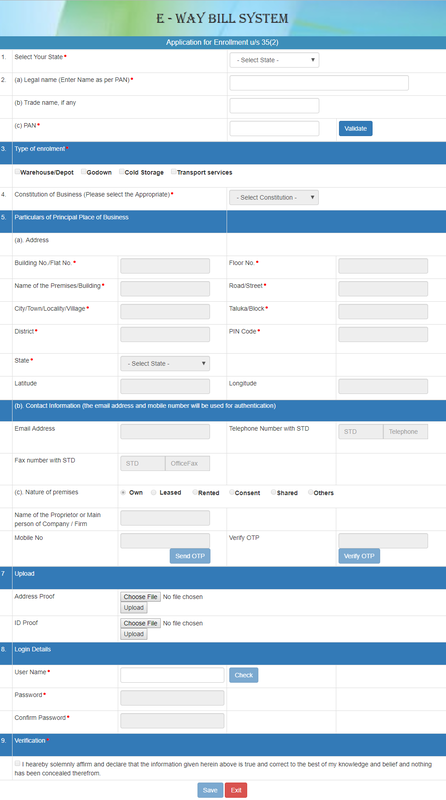 The user should fill in the GSTIN, name and contact information in the table provided to create a Customer Master. More than one customer’s details can be added. The following form is for those who are not registered under GST. Enter the state, name, and contact information of the customer and then click submit to create a customer master. Creating a supplier master is similar to creating a customer master. If you select the Supplier option under Masters, you will be directed to the following page. Users who are registered under GST can make use of the form below to create a Supplier Master. GST unregistered users can fill out the following form. The required details are filled and submitted to create a supplier master. To create a transporter master, you will need the transporter number or TRANSIN. You can enter this number along with the name of the transporter in the spaces provided as shown in the following page. 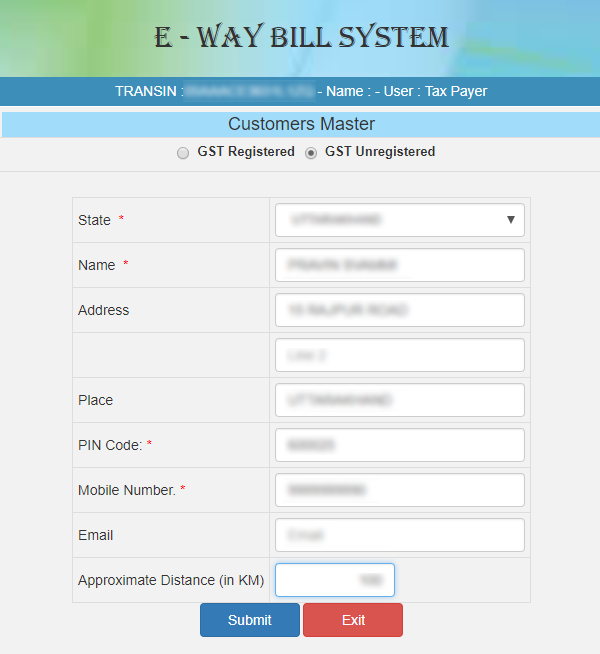 If you wish to reject an e-Way bill generated against your GSTIN, use the Reject option from the main menu. 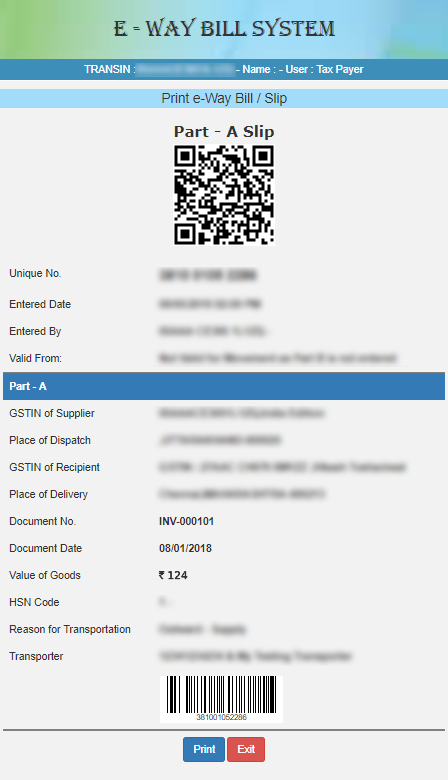 Select the e-Way bill number using the date it was generated in the form below. Click on the bill to reject it. Large businesses often operate out of multiple locations. It would not be very efficient to create e-Way bills from only one branch or headquarters, so the system allows for sub-users. Sub-users are other authorities who are granted access to use the system, by the original user. To create a sub-user, click Create Sub-user under the User Management option and enter the mobile number of the original registered user. An OTP is sent to the registered mobile number. Enter the OTP to be redirected to a form for creating a Suffix Login ID, which is used to generate a sub-user login ID. Next enter the name and contact information of the sub-user and the level of access to provide to the sub-user. Original users can freeze or remove sub-users. Select the Freeze Sub-user option to do this. A user can update a sub-user using the same method they used to create the sub-user. For the convenience of users, the system provides a few other ways to generate an e-Way bill. Here’s how you can register for them. Click the For SMS option under Registration and enter your registered mobile number. You will be redirected to the page below. Select the For Android option under Registration to be directed to the following page. Enter the OTP to select a user. The system then auto-populates the name and place fields. Then enter the IMEI number. 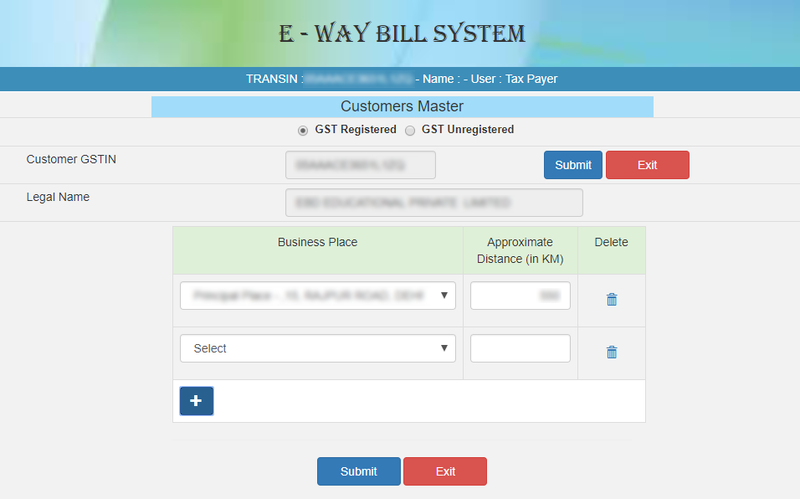 Users can generate e-Way bills for other individuals. Select the As Transporter/Taxpayer option under Update in the system, as shown below, to set yourself as a transporter/taxpayer, which will allow you to generate bills for other parties. Once the OTP is verified, the system will check if you want to register as a Transporter. Click Yes or No and then Save. 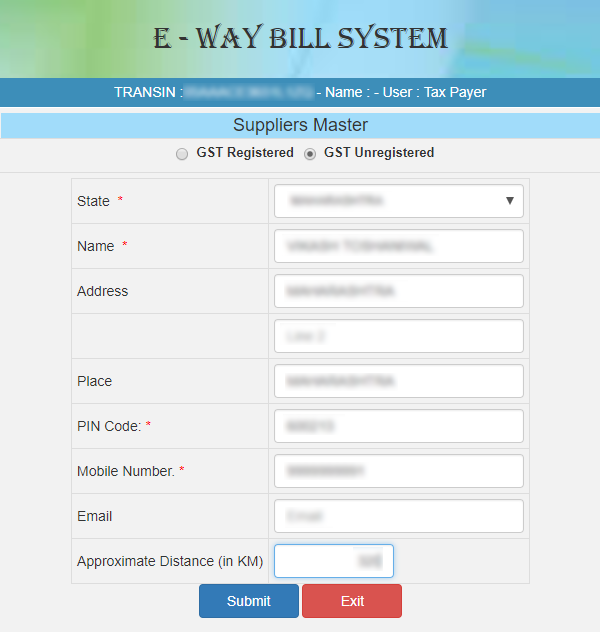 Users can add their business details from the Common Portal (CP) in the e-Way Bill Portal. This allows information to be auto-populated while generating e-Way bills, making the process easier. 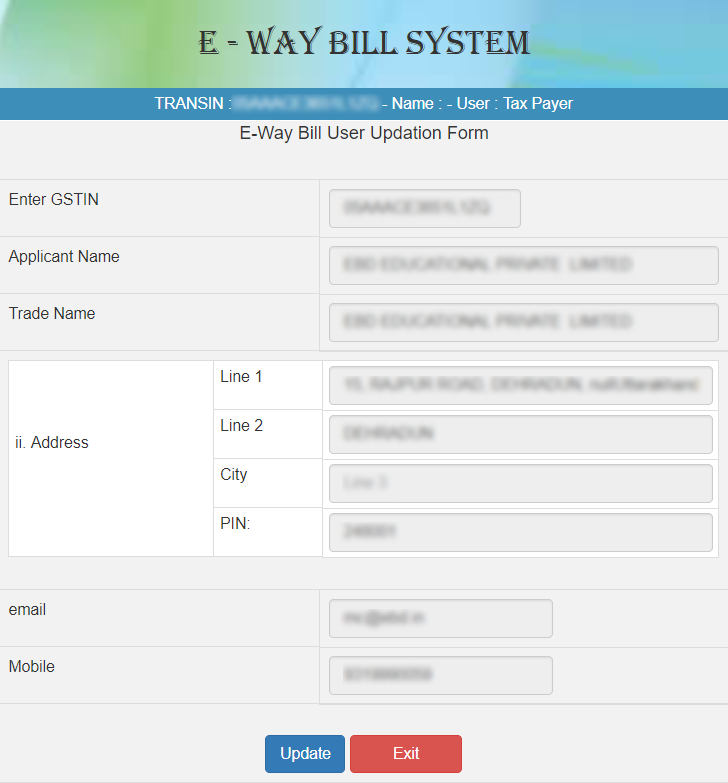 Details can be added by filling out the e-Way Bill User Updationg form, shown below. If the goods being transported or the vehicle carrying them have been detained by tax officers for more than thirty minutes a Detention Report, as shown below, can be filed. This notifies the tax officer to take necessary action.